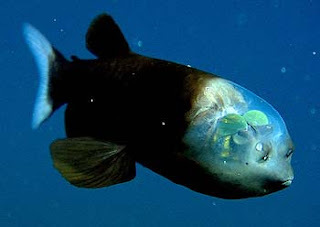 The barreleye has a transparent head and tubular eyes. What a strange fish...I wonder what he would taste like with tartar sauce? "Scientists say the eyes rotate, allowing the barreleye to see directly forward or look upward through its transparent head. The barreleye (Macropinna microstoma) is adapted for life in a pitch-black environment of the deep sea, where sunlight does not reach. They use their ultra-sensitive tubular eyes to search for the faint silhouettes of prey overhead." Read more over at Live Science.